Pa rents of a 13-year-old child came in to have me review the appropriateness of their son’s orthodontic treatment. The father had wanted to bring their son to me for treatment originally, but the mother saw an advertisement for a chain of orthodontic clinics, promising substantial savings. The mother’s wish prevailed, and the child was 1 year into orthodontic treatment at this clinic with little progress. I examined the boy. His was not a particularly difficult orthodontic case. I could have treated it in a little over a year and a half. But the corporate clinic had only fabricated some kind of removable expanders the child could not tolerate wearing regularly, and nothing much had been accomplished in the year of treatment. The mother looked visibly disturbed. She said, “Oh no. We have already paid $4000 for the treatment that has been done so far!” This woman had brought her son to a corporate orthodontic clinic thinking she would save money, and they totally wasted more money than what I would have charged to do the case correctly! Not to brag, but I have been doing complete bracketed orthodontic cases since 1987. I know what I am doing. If patients cooperate, we get cases done quickly. I know a hard case when I see one, and have the sense to refer it to a select few orthodontists I know the ones who are super-competent. Patients heed my recommendations about orthodontists very seldom. They listen to what I say. Then they go home and ask their friends and neighbors where to go, or they see some silly TV advertisement for a corporate orthodontic clinic, and go there. Many times, their case will never be completed correctly, if it is ever completed at all! One of my adult patients asked me about straightening his teeth. I could see his case would be very difficult, with a high probability of needing jaw surgery to complete. I made a strong recommendation of one or two excellent orthodontists for such exacting treatment. The patient ignored me, and went to a corporate clinic. Fortunately, he later called telling me that they planned to do his initial exam and put the brackets on the same day. This was preposterous! Any sane dentist would do an exam, take records, then do analyses and feasibility studies to work up such a difficult case as his. I spend at least 2 hours of analysis to work up an easy orthodontic case! Timing in orthodontics is often critical as well. Many cases, if started too early, will drag on for too long. These days, I often post photos of patients’ mouths online (omitting patient name, of course) and seek other orthodontists’ opinions about how the case should be treated. It would be ridiculous to put brackets and archwires on a patient the same day as the exam! After being warned of the foolhardiness of proceeding, this patient changed his mind, took my advice, and saw a competent independent orthodontist. This is not always the outcome! Unfortunately, too often corporate orthodontists succeed in slapping on brackets and archwires to “lock in” the patient’s treatment at that clinic. Only afterwards do they try to figure out how to treat the case! All good orthodontists forward a copy of their findings and treatment plan for a patient case to the treating general dentist. I virtually never receive these from corporate clinics, leading me to question whether there is even any logical treatment plan. I have received requests to extract teeth from corporate orthodontic clinics, then had to demand a rationale for the extrac­tions before I proceeded. I guess these orthodontists are under such pressures to perform, they allow no time for communication with the patient’s dentist! Corporate ownership of orthodontic practices began in the early 1990s, as a result of the oversupply of orthodontists. Private equity investors thought they could use the same sales and business techniques to straighten teeth as they used dealing with auto repair and vacu­um cleaners. Health care is different, because all humans are all unique. No two orthodontic cases are exactly alike. There are even some orthodontic cases that should not be attempted. It is important that treating orthodontists not be subject to the will and profit incentive of non-dentist investors to treat the maximum number of cases without regard to appropriate timing or case difficulty or without sufficient diagnostic preparation. Not every case I have seen from corporate orthodontic clinics has been done incompetently, but there are enough substandard case completions to be worrisome. One thing for sure: I don’t see any patient cost savings from corporate clinics, despite what is claimed in their glitzy advertisements. As with every other service, I have personally found that the highest customer satisfaction is given by professionals who own their own business. It is true for general dentistry, and it is true for orthodontics as well. Please be skeptical about TV, radio, or print ads telling you to patronize any particular chain of orthodontic clinics. If you have any doubt before treatment, don’t hesitate to ask me about any particular orthodontic group you are thinking of using. Do you perhaps fit in one of the following groups? *Employer offers no dental benefit plan. *Employer offers dental benefit plan but does not subsidize premium, so it is no deal. *Employer dental benefit plan excludes treatment you need, like implants. *Dental plan that employer offers is a crumby PPO or DMO that excludes using good dentists not on the insurance list. *You have a very healthy mouth, and virtually never need any treatment except regular cleanings, exams, and occasional x-rays, so dental coverage does not make economic sense. *You are a self-employed individual without any form of dental coverage. As expensive as dental care is, it really hurts to pay for it with after-tax income. Patients know that my #1 recommendation for funding dental care is through a FLEX benefit plan. It gives you complete freedom to pick dentists, and save all taxes on the money you put into it. You even avoid Social Security and Medicare taxes on salary you defer to the account! Trouble is, as good as FLEX benefit plans are, not all employers offer them. And self-employed individuals cannot use them, unless they have a C-corporation. A good alternative is to use a Health Savings Account, which is much more efficient than buying dental insurance. Unlike when using a FLEX benefit plan, you will not avoid Social Security and Medicare taxes. But it will save some Federal and State income tax. How would you go about getting a Health Savings Account (HSA) open? 1. You must select a high-deductible, HSA-eligible medical coverage. More and more employers are offering this option. Typically the deductible must be at least $1200. 2. Fund the account to an EXCESS of what you need to pay for your medical deductible and copayments. For instance, if your typical out-of-pocket yearly medical expenses are $1500, contribute that PLUS however much per year you believe you will spend on family dental expenses. Ordinarily one would think to only contribute as much as a dental plan premium would cost monthly. But remember that any dental plan includes substantial out-of-pocket deductibles and copayments. So a starter would be to contribute 150% of the cost of premiums to a good dental plan. 3. The best place I have found to open a Health Savings Account is Delta Community Credit Union, because they have no fees and pay a good rate of interest. Perhaps some other credit unions have as good a deal. 4. You will get an HSA checkbook and/or debit card to pay your dentist with. He will love you, as you save him so many insurance hassles! And no insurance company will prevent you from having any dentistry you feel you want and need. Individual dental benefit plans have always been a waste of money. We are finding that more employer-based dental plans are either poorly written, not a good deal, or both. Skipping the middlemen of dental plan underwriters can save you money and give you unlimited freedom of choice! Feel free to e-mail me at KimHenryDMD@mindspring.com if you have any questions about implementing HSA dental funding. Let us look together and see how decay really gets started, then go on to investigate how we may prevent it! Teeth are made of minerals, and are the hardest organs of the body- much harder than bone! Decay is a process whereby the hard enamel outside of a tooth is dissolved by acid. Once decay gets through the enamel, the same acid dissolution progresses very quickly in the inner dentin of the tooth. If the patient does not get the cavity filled, decay invade the tooth root (containing nerves) and a toothache results. So where does this acid come from? It can come from a couple of sources. The most common is from bacteria living inside our mouths. Many of these sugars utilize for energy, and produce lactic acid as a by-product. It is primarily this acid which acts to dissolve teeth. Bacteria can turn dietary sugars into lactic acid in only 20 minutes. Unless the mouth is rinsed or cleaned, this acid hangs around to dissolve teeth for a whole hour! So you can see that a child who ingests candy most of the day will have an acid mouth all day, an inevitably have move than a few cavities! An adult who sips sweetened coffee most of the workday will likely suffer from the same fate. But adults frequently get acid more directly- by drinking soda pop! Few people realize what strong acids carbonated beverages really are! Carbonated drinks are such potent acids that they can dissolve teeth directly whether the soda is “diet” or has sugar in it. I would estimate that 75% of adult decay I see is the direct result of excessive soda drinking. And as if that were not enough, too many sodas can contribute to stomach ulcers and even osteoporosis. 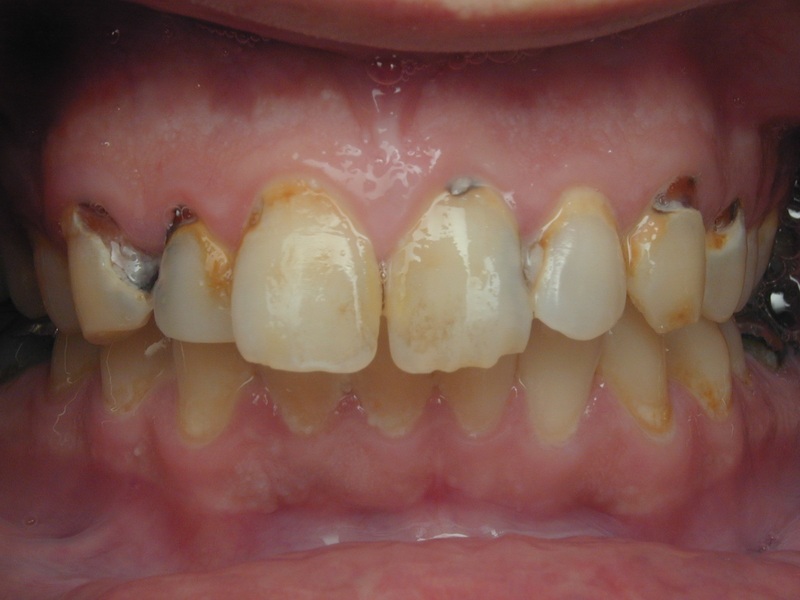 Excessive daily soda pop intake caused characteristic tooth decay around gums. Chronic vomiting, as seen in bulimia and some other disorders, can erode teeth and also cause cavities. We have noted lately many cases of gastric reflux, where small quantities of stomach acid enter the mouth. This causes rampant destruction in your mouth, and should be controlled by prescriptions or surgery! Don’t some medical conditions expedite decay? Yes. Although not directly a cause of decay, any condition which dries the mouth can make your teeth more susceptible to it. Examples are doses of radiation to the head, using certain antidepressants, and antihistamines. We find that people that are mouth breathers are prone to more decay than those who can breathe normally through their nose. Even should physicians be unable to treat the above medical conditions, we still are able to stop decay- provided we have patient cooperation and fluoride. Fluoride actually works two ways. It has a toxic effect on decay causing bacteria. It also hardens tooth enamel and makes it more resistant to acid attack. Interestingly, fluoride strengthens bone in the same way it strengthens teeth. Physicians sometimes use fluoride supplement to treat osteoporosis. For adults with decay problems, we often prescribe a fluoride gel to brush on the teeth at night just before bed, and a fluoride mouth rinse in the morning. For really tough cases, including patients who have uncontrolled gastric reflux, we make custom trays to wear with fluoride at night. With this heavy-duty preventive treatment, few patients get cavities! What is going on? To understand, one has to grasp how the shell game of dental “insurance” has evolved over the years. In the first generation of dental benefit plans, reimbursements were based on something called “UCR” fees. UCR stands for usual, customary, and reasonable. Fees were based on a percentile of real fee surveys within zip codes. They had a real resemblance to fees charged by dentists in the community. Sure, some insurance companies gamed the system by not updating their UCR fees with any regularity. But by and large, when insurers promised patients “100 coverage for preventive treatment,” the claim was generally correct. In the second generation of dental benefit plans, called PPOs, fees were still based on some sort of UCR ideal. These plans were concocted to save employers money. They promised to deliver patients to dentists who participated (by signing slanted contracts) with plenty of patients, provided the dentists billed 20 to 30% less for procedures. Often this was the dentists¹ whole profit margin, so most resorted to procedure upcoding and other antics to make up the difference. The dental insurance companies really did not care. The important point of these plans was that they penalized patients for choosing their own dentists. A cleaning covered at 100% at a “participating” dentist would be covered at only 70-80% by a freedom-of-choice dentist. In the latest generation of dental benefit plans, employers have flexed their muscle with dental insurers. Many now only pay companies a per-claim fee for administration, typically $5 or less. Employers now designate any “allowable” fee they wish, based solely on a cost target for their company. In these plans, any fee whatsoever can be designated for any procedure. For example, an employer can set $25 as an “allowable” fee for a dental cleaning, even though no dentists in the US may charge so little. The fee is merely a fairy-tale price concocted on the whim of the employer. Meanwhile, the card given the employee still says “100% coverage.” But sadly, when employees use the benefits, they may discover the plan only covers $25 of a $90 cleaning. Few employees truly understand what is happening, and their anger is deflected onto the dentist. Instead, they should blame the employer, who is playing a deceptive shell game with its workers. The whole driver of these shenanigans is the desire by employers to save benefit dollars. We can certainly empathize with that goal in this difficult economy for business. However, we think honesty with employees is a better path than deception. The honest thing to do would be to cut the benefit maximum, or lower percentage reimbursement for dental services. Unfortunately, that makes it a lot more obvious to employee-patients that benefits are being cut. Thus, the deception of employer-proscribed low “allowable” fees goes on. We remind our patients once again that dental “insurance” is an inefficient contrivance born in an era of high marginal tax rates. The crucial test of your dental plan is whether it pays out more in benefits each year than the premiums you pay for it. With employers cutting benefit plan subsidies and at the same time lowering “allowed fees,” fewer and fewer dental plans are worthwhile. It seems remarkable, but if an employee is covered by a FLEX benefit or 125S Cafeteria plan, it is usually more economical to drop the dental benefit plan. Paying for dental expenses by a FLEX or Cafeteria plan is more efficient, and gives you complete freedom of choice in choosing dentists!